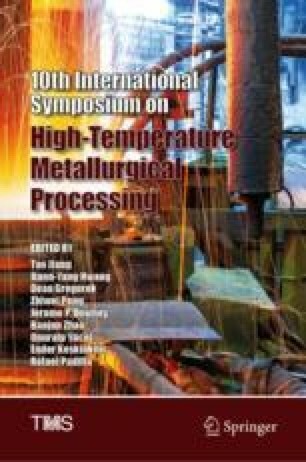 Vacuum distillation of Zn-Al-Fe alloy was discussed based on the experimental investigations of the distillation temperature, the holding time and the pressure of pressing block by response surface methodology. The experimental results showed that zinc can be satisfactorily obtained from Zn-Al-Fe alloy with suitable distillation temperature, holding time and the pressure of pressing block. The zinc in Zn-Al-Fe alloy was effectively recovered at 1073–1123 K for 60–75 min, and pressure of pressing block was below 50 MPa. When the temperature was 1073 K, the holding time was 75 min and the pressure of pressing block was 40 MPa, the zinc content in the volatiles was about 98.35% and the aluminium content in the residue was about 92.22%. This work has been funded by the Fund of Yunnan science and technology plan project under Grant No. 2013FZ012, the National Natural Science Foundation of China Youth Foud of Study on mechanism of vapour condensation from complex gas of As-Pb No. 51504115, the Cultivating Plan Program for the Leader in Science and Technology of Yunnan Province under Grant No. 2014HA003.